Lowering your credit card interest rate (APR) can potentially save you hundreds per year. Negotiate yours today using my battle-tested, word-for-word script. Credit cards can be an absolute nightmare. Practically, everyone has a story about falling into debt, paying late fees, or dealing with unauthorized charges. That’s why it’s so important you optimize your credit cards to make them work for you instead of the other way around. And while there are many different systems you can put in place to achieve this, I want to talk to you about one element of your credit card that can potentially save you hundreds a year: credit card interest rates. I was fortunate enough to come out of school with no student loans, but do have $4,364.11 in credit card debt over 2 cards. One is $999.03 and the other is $3,365.08. I just started reading your book yesterday, today I called the card with the higher balance to lower my APR from 19.99%. I have had this card for almost 4 years. My Mom had been paying the minimum for a year or so, but since I became full time I took over any other bills my parents were paying. I have paid $200 the last 3 months and my minimum payment is around $89. Anyways, I just called and asked, (I had to do no negotiating really, I just followed the script you have in your book) and I got my APR lowered from 19.99% to 14.24%, effective immediately. Basically, the $13.95 my girlfriend paid for your book will more than pay for itself by the time I get my next bill. By lowering his credit card’s interest rate down just a few percentage points, he’s able to pay down his credit card balance much faster. Now THAT’S a Big Win. Today, I want to give you a breakdown of your credit interest rate and the exact script you can use to lower your interest rate today. What are credit card interest rates? A credit card basically gives you a short loan for the month. If you pay it off completely during that monthly period, you don’t pay for the loan — it’s an interest-free loan. Pretty useful, right? Well, if you don’t pay off the loan in its entirety — let’s say you spend $1,000 on your credit card but can only pay off $500 that month — then you have a balance on your card of $500. Your credit card balance then has an interest charge. The size of that interest depends on what’s called the Annual Percentage Rate (APR). Don’t be fooled by that name either. Your credit card company uses your APR to find out how much to charge you on your statement each month. So in the example above, you’d be charged $8.33 that month based off a 20% APR. ($500 balance x 20% interest) / (12 months) = $8.33Your APR will vary depending on a number of factors such as what kind of card you have and how long you’ve been building credit. According to a Federal Reserve report, the average credit card interest rate is 13.8%. If you’re a weirdo like me and REALLY want to get into the weeds of your APR, you can even calculate your daily APR. Doing so is simple: Take your credit card interest rate and divide it by 365. Voila! You have your daily credit card interest rate. You can take that percentage and apply it to your credit card balance at the end of the day. That’ll give you an accurate reflection of how much you owe the credit card company based off of your balance. If you’re currently working to get out of credit card debt, this number could make a world of difference in how much you’re paying off each month. That’s why you’re going to want to lower your credit card interest rates. Lucky for you, I have the exact script to do it. Since the average APR is typically somewhere between 12% and 15%, it can be extremely expensive to carry a balance on your card. Think of it like this: The average long-term return on investments in the stock market is around 8%. If you could get a 14% return on your investments, you’d be thrilled! That’s exactly what credit card companies all over the world are doing. You want to avoid the black hole of credit card interest payments so you can earn money — and not give it to the credit card companies. That’s why you should call your credit card company and ask them to lower your APR. Here’s a simple script you can follow to help you. YOU: Hello, I’d like to lower the APR on my credit card, please. YOU: I’ve been a loyal customer to you for X years. Also, I’ve paid my bill in full and on time for the past few months. I know a few other credit cards offering better rates than what I’m getting right now, and I’d hate for this interest rate to drive me away from your service. What can you do for me? CREDIT CARD REP: Hmm. Let me check…Mr. Sethi, I just discovered that I can lower your rate from 15% to 12%. Will this work? Step 1: Hang up the phone. Step 2: Hold up one hand above your head. Step 3: Use your other hand to high five yourself because you just successfully negotiated a lower APR. This is a quick and easy way to get a Big Win with one phone call, BUT it’s also completely unnecessary. BONUS: If you want even more tactics you can use to optimize your credit cards, check out the 2-minute video below, which was recorded in approx. 1976. It’s important to note: Your credit card interest rates don’t matter. I’ve gotten some heat for this idea but I don’t care. At the end of the day, it shouldn’t matter how much your APR is. It’s simple: I never carry a balance on my credit card — and neither should you. When it comes to making purchases, if I can’t pay it off at the end of the month, I don’t buy it. It will cost you more than $6,000 in interest and take you 67 months to pay off the balance. Even if you don’t buy another thing in that time! This is why credit card companies are so incredibly profitable, especially with young people who don’t know any better. Don’t carry a balance (if you do, pay it off as quickly as you can). Pay the maximum possible on your balance every time. If you can’t pay off a purchase by the end of the month, don’t buy it. “But Ramit,” people say, “what about homes and college and cars? How can I pay that off in one month?” Yes, true, those very expensive purchases necessitate some kind of longer-term loan. But not with your credit card. So when I hear people excited about their introductory interest rate (“It’s 0% for 6 months! !”), I’m not really impressed. As long as you pay your balance in full every month, your credit card interest rate is meaningless. 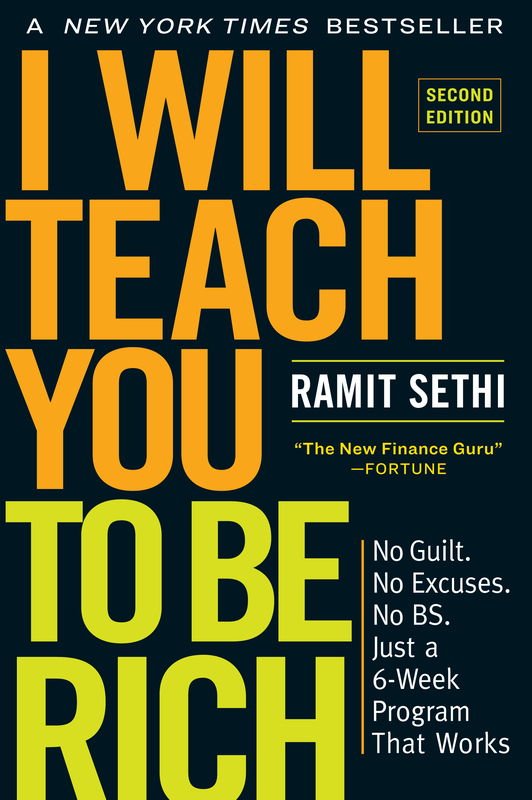 You can now get a full chapter from my New York Times bestselling book, I Will Teach You To Be Rich, on optimizing your credit cards, for free. It’ll help you tap into credit card perks, max out your rewards, and beat the credit card companies at their own game. All I ever think when I get these offers in the mail is: WHY WOULD YOU EVER CARRY A BALANCE ON YOUR CREDIT CARD!? (Thank you for yelling on my behalf.) I don’t even know the interest rates on any of the credit cards I’ve ever held. I admire your discipline and agree with your advice. …my cynicism provokes me to say (perhaps controversially) that the fact you are a student at Stanford gives you more flexibility in managing your finances than other students. I have recently paid of an outstanding balance of two years and just feel such complete relief. There have been times when I have had to suddenly put large costs on my card – such as car insurance changes, travel costs, suit for graduation interviews etc. Sometimes the money just isn’t there when it has to be! You don’t have to have the shopping habits of Karyn Bosnak in order to find yourself short of cash. You’re correct in saying that interest rates do not matter if you pay off the ballance every month but check your statement on how interst is calculated. It is not calculated on the balance remaining after your payment. I admire your mission and I think I understand the point of chossing the title you have for your blog. I teach people to achieve financial independence, which is a different state of mind than rich, altogether. There are rich people going bankrupt everyday. FI is a a condition of enough to meet your needs; sadly, rich is a distorted vision of a certain level of consumption (usually) that some people carry around in their heads. Roque, you’re right about the interest accruing on each purchase the month after you have a running balance. Thanks for pointing that out. Some credit cards use the nefarious two-cycle daily balance, which keeps you paying interest on half of what you’ve paid off for a FULL MONTH after you make your payment. Watch out for this trap! Well, I don’t agree with you 100% on not carrying a balance, that’s a lifestyle choice. Get one that gives you a year at 0%. Then ‘pay-off’ another CC. When I say pay-off, I mean pay it to another card with no balance. Then have that other card cut you a refund check. Then use that refund check to put it into an investment, like INGdirect.com. Then make ~$100 month off of interest alone, for doing VERY LITTLE. What a small world !, My name is Roque Curiel also. We share many financial credos. I refuse to carry a balance on our two credit cards and actually get 1% cash back on our Golden 1 Visa card. I bought your book from Lulu.com but it looks like the printing was not complete, I did not get the seven steps to financial freedom, the book ended abruptly. My wife was surprised when she read the book, she thought that most of the ideas related to my way of thinking, except for the deep quotes. Anyway, we are a family of four with a mortgage of $1506.00 per month and a second (swimming pool) of $467.00 per month. our income is about $105,000 pretax and we have a couple of retirement and colllege funds (Retirement is payed by our employers, college fund is $100.00 per month). We have about $300,000 equity in our house and plan to stay here for quite a while. Any suggestions ????. Ah, but if your credit card offers a fixed rate balance transfer that is lower than the interest rate of your current student, business or car loan, and you don’t use that card for anything else, it can be quite economically smart to carry the balance there rather than with the higher rate lender. For example, we took out a small business loan which I transferred to a credit card at 2.9% fixed. I don’t use the card at all. Just make the biggest payments we can every month. We did the same thing with our car loan and the balance on my student loan. Because you can’t beat a 2.9% fixed APR. Run these numbers, pay 50% of a credit card balance each month for 6 months or less, calculate the actual real rate of interest. I carry a 30% balance on my cc. This is a strategy I am using for building credit. It is a low limit card, that I use only for already budgeted monthly expenses. I do not care what the interest rate is, because the credit it is building for me will allow me to make many times that amount. Credit is like a muscle- use it or lose it. Use it wisely, and it can be an invaluable tool to financial freedom. Wait, why 30%? Have you heard of your debt-to-credit ratio? Lower is better for your credit score. prlinkbiz, you’re nuts! i started out with a low credit limit on my first card (I also got it to establish credit), and within 6 months of paying the whole thing off every time, the company raised the credit limit from 500 to 2000. I’m sure they would raise it more if I needed it. Forgive me, but in my opinion this post and the sentiments expressed in it, are dead wrong. One thing is absolutely right however – your credit card interest rates DON’T matter, but not at all for the reasons expressed. They don’t matter because if you use it like the very powerful tool it is, your credit card can make you lots and lots of money. If you borrow say $3000 on a credit card at 2.9%, and use that money as the down payment on a rental property that costs $30,000 and pays you $400 per month in rent, you have effectively just given yourself a 2.9% second mortage – something simply not possible ordinarily. This means you will have gotten into a “no money down” deal, that puts additional cash in your pocket every month, net of expenses, management, everything. Think I’m making those number up? Think again. I have 4 such properties right now with more coming regularly. Paying off your credit cards every month being good for your credit is ALSO a total myth. Anyone who has actually put this into PRACTICE knows that the best way to increase your overall credit picture as far as credit cards goes, is to use them, and pay them off over 3 months or so. How do I know this? Well, I’m no guru… but I would say I’m an “expert” based on experience, not based on what I write on the internet. I paid off a Chapter 13 bankruptcy in January of 2006 (this year – just 9 months ago!) As of a month ago, I had a 718 FICO score. How on earth do I have a 718 score fresh out of bankruptcy? Working the system. Using the rules of the system to my advantage. I have one credit card only, and it had a 700 limit. By using it and paying it down over a couple months at a time, I now have a $1500 limit on that card and could probably get other cards if I wanted to, which at this point I don’t (by the way, the best number of credit cards to have is 3). So in closing… please do not believe everything you read ESPECIALLY on the internet. When it comes to your financial future, you need to do your own homework and get as many different points of view on the subject as possible, and you need to be in many different investment vehicles in order to find the one(s) that suit you best. Personally, I like to make infinite% returns, which is quite easy when you learn how to produce positive cash flow without using any of your own money. Oh also I would say that a very valuable book for us has been the eBook available at www.learnaboutcredit.com – we put into practice what he writes about and saw immediate results to our credit scores, limits, and overall comfort with utilizing credit to its fullest extent. I have a credit card with 18.99%. I don’t mind too much as I get cash back and I pay the balance in full. Thanks for posting an article that has common sense. The 3% transaction fee wipes out any profit one can make on a low interest card. Well, you should know if you have great self control it is also wonderful to use balance transfer offers for car loans. I have really good credit and do get the “great low rates on cards” so I am one of those that also gets the 18 month 0% offers or 1.9% offers for 12mths. Most recently I got an offer of 0% for 12 months. In the past 10 years I have bought two cars totaling $45,000 and used balance transfer offers. I have paid less than $400 to 500 to do this, total for these cars including interest and transfer fees. This is a steal. No, I did not have much saved up either. Anyway, think about the interest on a $20,000.00 car @ 7% for 1 Year. That is around $1,400 for the 1st year alone. YUCK! SO…Think about it. The low rate is definitely important. The difference is that you don’t need the flexibility of carrying a balance past one month, but some people do. Personally, I only use them for car loans because I do better than saving up or financing through the bank or credit union. Sounds like you need to just cut your credit cards up and use a debit card. I am a little confused as to why you are giving this kind of credit card advice though. Afterall, all you need for an emergency is a debit card, anyone can run it as a credit. I never give out my pin number and always run it as a credit, everyone knows that. Check with your bank. That way when you tell people interest rates don’t matter it will be because you don’t have one, instead of the fact that someone elses may be lower than yours. It just sounds like to me you are fed up with a few braggarts that told you your rate was too high. Can’t really blame you for that either though. They can be pretty annoying. Met one this past weekend. GOD BLESS!!!! That being said if you do pay the minimum payments that your bank ask which is about 2%, then yes it will take you a lot years to pay off the debt and you might end up paying twice as much all depending on the interest rate! Just take a close look to your card statement and they will definitively tell you how much your minimum payment is and if you choose to pay just that how long it will take you to pay it off and how much money you will end up paying and don’t believe all the banana people post!!!!! I don’t see why the letter writer is crowing about not having student loans. If it was necessary to borrow money (doubtful) student loans would be accruing less interest. agree For additional information about our private loan offers, contact us at: (KELVINFINACIALCOMPANY@YAHOO.COM). Hello everyone. Am here to testify how I got my loan from Mr.John Spencer after I applied several times from various loan lenders who promised to help but they never gave me the loan. Until a friend of mine introduced me to Mr. John Spencer promised to help me and indeed he did as he promised without any form of delay.I never thought there are still reliable loan lenders until I met Mr. John Spencer, who indeed helped with the loan and changed my belief. I don't know if you are in any way in need of a genuine and urgent loan, Be free to contact Mr. John Spencer via his email: Johnyspencer102@gmail.com or Whatsapp:+1 (630) 519-9078}. I can’t believe how quickly Superb Technologies worked for me. I was concerned that the severity of my credit issues would take months to fix, but with the help of Superb Technologies, it’s taken half that time. They got the ball rolling the same day I called and within a week they had already begun fixing to dispute my problems. The turn around has been outstanding and timely. I am approximately six (6) days into the process, and I’m so happy with my service. They has been able to answer all my questions while offering the finest professional assistance money can buy.They have also given me the best insight into how I can make the most impact on my credit later on down the road. I would recommend Superbtechnologies444@gmail.com to anyone. I am so thankful that I reached out to them for their service. I lost my house about 3 years ago, my credit score was 535. I can't afford to rent a comfortable home to live, because even landlords run credit checks, so I need to apply for a home loan it was the most horrible and screwed moment of my life . I read about this credit coach on a credit score forum, how he had helped many people with their credit issues , I finally give him a try so I contact him via his gmail (cyberhack005). I wrote a letter for each thing on my credit report basically, and he gave me the assurance that he will fixed. I couldn't believed this at first but a week later my credit which was low increase which I also confirm on credit reporting agency file. This is totally incredible i can now buy a home.